The living room of the home at 4363 Rivercrest Drive North is no different than what one might expect. There is a bookshelf with books, a collection of dolls sits atop it, an entertainment unit with a flat-screen television and an assortment of DVDs, some unfolded laundry covers one of three chairs. There are family photos on the walls and an aquarium with a half-dozen or so fish. Cats dart through the room at will, but no one has any idea how many “belong” at the house. “It looks almost legit, but she was trying to steal the house,” said Sgt. Bob Trump, of the Keizer Police Department. “She” is Michelle C. Reid, aka Michelle Ristau, a woman who allegedly moved into the residence late last year while it moved through the foreclosure process. Reid was not present during the search, but police are planning to pursue charges related to fraud and theft. “We were able to contact the former owner and – between talking to him and looking at some other factors – we were able to get a search warrant to come in and look for evidence related to identity theft and trespassing,” Trump said. Reid was not the only person at the house, there were up to five other “tenants” that she was subletting rooms to in the past nine months. Reid herself is a convicted felon – on charges of theft, fraud and identity theft – and several of the suspected renters are suspected felons as well. While the front room of the home and attached kitchen, as well as the master bedroom, give the place a feeling of permanence, a quick look through other spaces betrays that notion. Two small bedrooms have piles of clutter and beds with no frames. 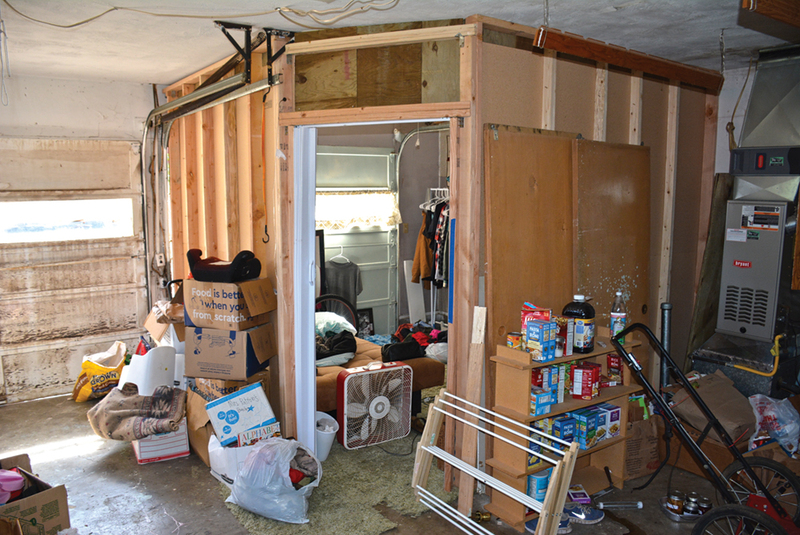 In the garage, a small section of the space has been converted into a fourth bedroom, but the studs are still visible on the outside of the walls. Next to the furnace, an open cabinet reveals jar upon jar of home-canned food along with others that are store-bought. An enclosed addition in the rear of the home is set up as a children’s area. Bright posters with shapes and colors hang on the walls, a small table with four chairs sits in the middle of a play area. Oregon Department of Human Services agents will handle that part of the investigation. “This wouldn’t have been a good place for kids,” Trump said, alluding to Reid’s prior felony conviction. Keizer officers with the Community Response Unit began watching the house back in March, although it’s believed Reid moved in sometime between October and November 2016. “We spoke with some of the neighbors and they had complaints about people coming and going, trash and other livability issues. We spoke with (Reid) and she said she was here lawfully and closed the door in our face,” Trump said. Patrol officers have also responded to calls for service at the address on several occasions including twice in the past week alone – once for a noise disturbance on July 25 and then on July 26 on a report of an assault. At some point, Reid allegedly took paperwork around to some of the neighboring houses that purportedly assigned her ownership of the home, but neighbors grew suspicious and could find no official records of a sale. Two of the subletting tenants waited outside the home while officers searched the interior. Police were planning to let them back in once the search was completed to grab some personal items and then again later in the day to remove other contents, said Ben Crosby, Keizer’s code enforcement officer. “After that we’ll finish boarding it up and turn off the water and power. It will also have a bright orange notice telling people to stay away,” Crosby said. Crosby himself had received a complaint from one of the former tenants. “She called me saying that she was unlawfully evicted and alerted me to a squatter being here illegally,” he said. Crosby held off on further investigation at the behest of KPD. The home is the second one KPD officers rousted squatters from this year, and Trump said the problem isn’t going away.